A few weeks ago I reviewed “Artisan Bread in 5 Minutes a Day” and while I have made a few of the normal bread recipes in the book with perfect success, I had never made a sweet dish out of the book before this recipe. I cannot express how impressed I was with the results. 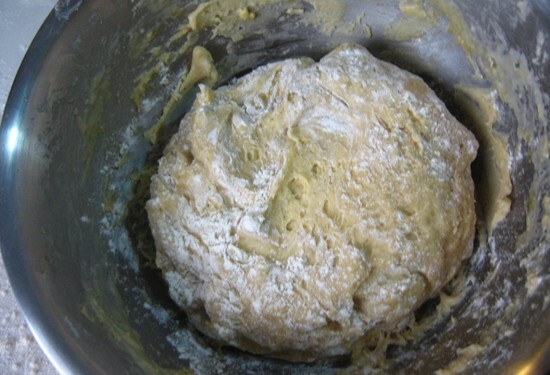 The dough was very easy to make and the process was simple to follow. The book says that you can use either the Challah recipe or Brioche recipe from the book. I went with the Brioche. Homemade beignets are surprisingly easy to make and definitely worth the work! 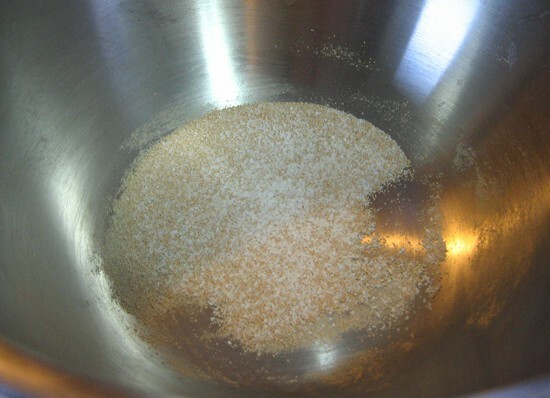 1) Combine yeast and salt in a large bowl. 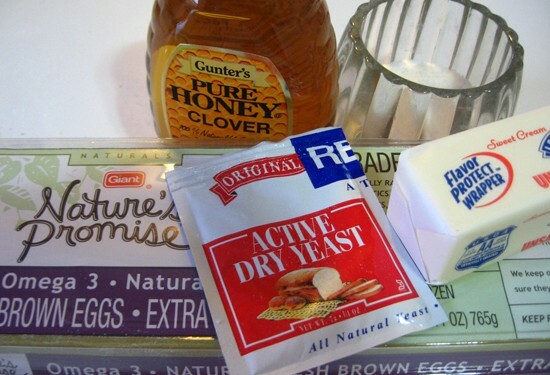 Then add all of your wet ingredients including eggs, honey, butter, and water. 2) Then you want to add the flour. The dough will be very wet. After you add your flour, stir it well, but don’t worry if there are some lumps. 3) Let this dough rise in the bowl at room temperature for at least 2 hours. It will at least double in volume. 4) You can punch it down a bit at this point and then cover and chill it for at least one hour. Then you can use it right away or store it in the fridge well covered for up to 10 days. 5) When you ready to make the beignets, dust the dough with some flour. 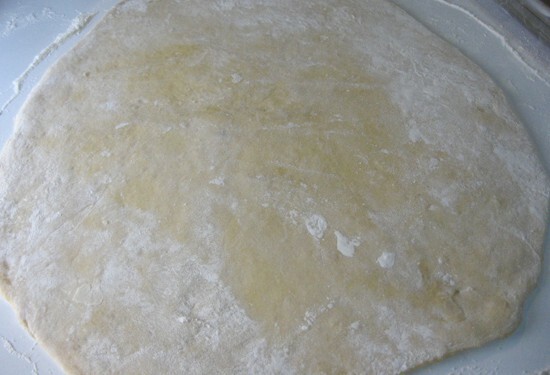 6) Roll the dough out until it’s 1/4-inch thick. Use more flour if the dough is sticking. Then take a knife or, even easier, a pizza cutter, and slice up the dough into 2X2 inch squares. Let the dough rest for 20 minutes after you cut it. 7) Preheat oil to 350 degrees in a large pot. 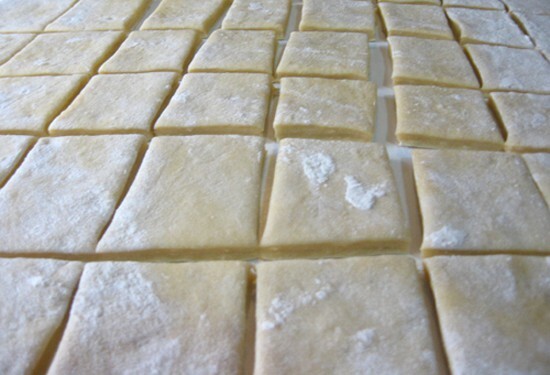 Fry dough squares in batches for about 2 minutes per side until they are golden brown. 8) Take them out with a slotted spoon and transfer to a paper towel to drain quickly. Then dust with powdered sugar. Use a heavy hand here. Recipe adapted from Artisan Bread in 5 Minutes. I started with combining my yeast and salt in a large bowl. 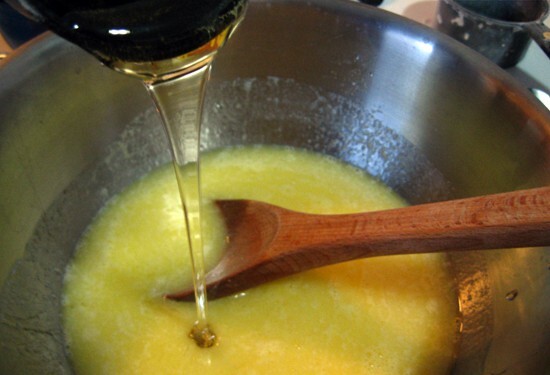 Then add all of your wet ingredients including eggs, honey, butter, and water. Add the wet stuff including the honey. Then you want to add your flour. The dough will be very wet. Keep in mind that you are going to chill it before you use it so it will firm up quite a bit. After you add your flour, stir it well, but don’t worry if there are some lumps. After a 2 hour rise. You can punch it down a bit at this point and then cover and chill it for at least one hour. Then you can use it right away or store it in the fridge well covered for up to 10 days. This is why the recipe is so great because it lets you make the dough when you have time and cook it when you need it. I made my dough two days before I needed it. 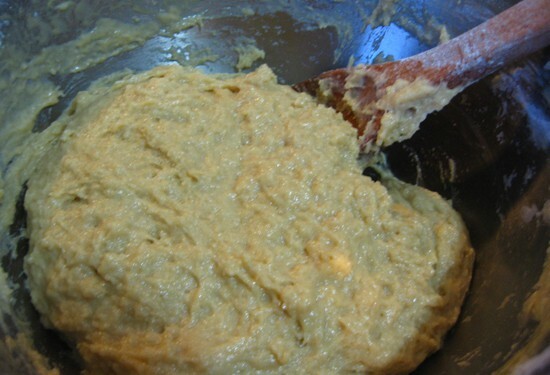 Since the dough is so wet, before you take it out of the bowl, dust it with some flour. You could just pull off as much of the dough as you need and store the rest for later. I just rolled all of mine out. Keep the flour going because the dough is wet. It’s about 1/4 inch thick. Then take a knife or, even easier, a pizza cutter, and slice up the dough into 2X2 inch squares. Let the dough rest for 20 minutes after you cut it. This will let the dough relax a bit and come to room temperature. Very important. These guys puff up beautifully. Then just drop them in a pot of oil at 350 degrees. If you don’t have a candy thermometer to get the temp exactly right, just test the oil with a single beignet. It should quickly rise to the surface and brown nicely on one side in about 2 minutes. After you get confident you can do a few at a time. You could put in more than 5. I wasn’t in a hurry. Two minutes per side is all it takes for that lovely golden brown. Take them out with a slotted spoon and transfer to a paper towel to drain quickly. Then dust with powdered sugar. Use a heavy hand here. These are delicious, but I think the best part about them is the dough. It’s so flexible and easy to make. I rolled out all of that dough, made just half of them, and then stored the rest of the dough for the next few days. It’s a really great recipe. Mmmm… brioche beignets – what a wonderful morning thought and I’ll be thinking it all day! This recipe looks delicious and fairly easy to follow. My husband and I had a mini-honeymoon in New Orleans. I had my first taste of beignets while there. I think I will surprise him with a batch of these- he will be thrilled! These look amazing. I love that bread baking book. I was in a book club at one time… and what I enjoyed most about it was creating food that somehow related to the story! wow, you make it look so easy! I’m definitely going to have to try this out. I’ve made doughnuts before with great success , so I’m sure I could do this :) I’ve always wanted to make brioche as well. hose look so light and puffy and golden brown and good! I’ve seen a few people make these donuts now and I definitely have to give it a try! I love the Artisan Bread in 5 book, it’s really great. Ohhhh those look soooo good. 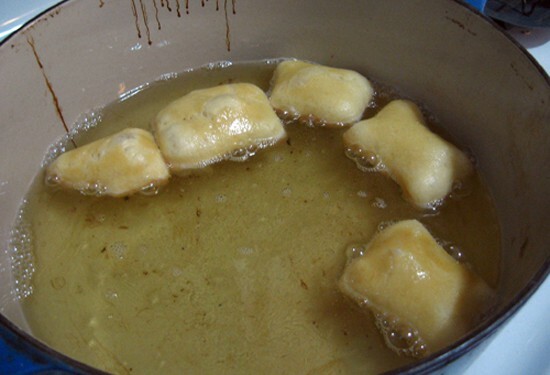 I was curious: what oil do you use to fry your beignets in? Thanks for all the nice comments everyone. As far as oil goes, you can use pretty much any oil. I went with Canola here because I had a bunch of it on hand. I would stay away from strong flavored oils like peanut or olive oil. I first had these wonderful beignets at a car show of all places!! 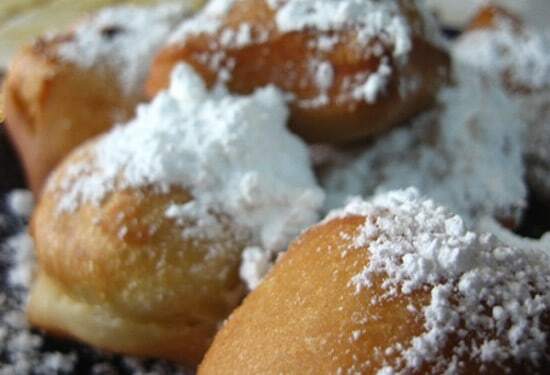 They topped their beignets with flavored "syrups" & powdered sugar. When I bit into one I thought I'd surely died & gone to Heaven!! Thank you for the recipe so that I may share this little bit of Heaven with people I love!! One quesion, approximately how many did you get out of the 1/2'd recipe? Thank you in advance! I followed your halved brioche recipe to make apple fritters and they were fab! The dough was so easy to make and fried up beautifully! I posted the apple fritters here — http://blackjackbakehouse.com/home/2012/4/19/apple-fritters.html — and linked back to you. Thank you for the recipe!